Scivation manufactured Xtend which is a BCAA (Branched Chain Amino Acids). BCAA act as the building blocks of protein and improve protein synthesis. BCAA helps to increase muscle recovery and endurance which is a common problem in many people during workouts. If you are facing the problem of sweating, muscle pain, stretch and looking for something that supports your body for the muscle growth so Xtend BCAA should be your first choice and is just right for you! For years, people have used and are recommending this high quality and natural product. Scivation was founded in 2004 with a vision and mission to redefine the nutritional industry and serve the fitness community by providing high-quality nutritional and best-performing products. Scivation serve as a formulator, seller, and researcher to build on the foundation of science and innovation. Scivation offer its loyal customers with a refreshing variety of flavors and extra vitamins to stay healthy and active. Scivation revolutionized the nutrition category when it included electrolytes to the formulas in 2011 and the patented PEAKO2 to create XTEND perform in 2015. Many new types of research are underway and we are sure Scivation would surprise with more amazing products. For advice and additional information about this supplement or helpful tips, you can contact the manufacturing company directly at the following phone number: 866-996-3489. Ingredients: L-Leucine, L-Isoleucine, L-Valine, L-Glutamine, Trisodium Citrate Dihydrate, Potassium Chloride, Sodium Chloride, and L-Citrulline Malic Acid. Other ingredients: Watermelon Artificial Flavor, Citric Acid, Sucralose, Malic Acid, Acesulfame Potassium (Ace-K), and FD&C Red Lake #40. Everyone faces the problems of extra sweating, Muscle stretch, pain and tiredness during a workout and many supplements are available in the market to fix this common problem. To get the best thing, you must make the right choice. Over the past years, BCAA supplements are getting a lot of popularity among the fitness community. BCAA is very important in maintaining muscle mass while being on a calorie-deficit diet. 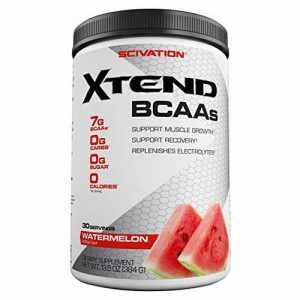 Scivation Xtend BCAA is hugely getting popularity among the pro athletes and beginners. The variety of flavors and versatility of ingredients are providing an extra kick to its performance and demand. Xtend BCAA is carbohydrate and sugar-free and comprises of 7 grams of BCAA in each serving. Well! That’s what we want. It is available in the market in 16 refreshing flavors, each with distant smell and color. Each flavor is in its leveled intense form which reflects the quality of products. Just pick the one right for you! It is recommended to use Xtend BCAA before the workout but as it contains a lot of electrolytes, extra nutrients that support muscle retention and hydration. A very good news that, it can be taken any time of the day as its quite safe and reliable. Each ingredient is blended with through Research and trials and it provides the best value to its consumers. You must mix 1 scoop of Xtend BCAA powder with about 8 OZ of water and there you got a well-balanced nutritional drink. The wide variety of electrolytes may help to prevent dehydration and keep your muscles and nerves functioning accurately. How Much Does Xtend BCAA Cost? Xtend BCAA is a little less expensive than other similar nutritional supplements. Where To Buy Xtend BCAA? Xtend BCAA can be ordered online from different places but our recommendation is to either buy it directly from the manufacturer or purchase it from trusted online retailers which may offer you discounts. We did a research on other products from Scivation. Here is a complete list.